Your voyage of discovery through Namibia will literally take your breath away, as the country has it all – from dramatic landscapes, abundant wildlife and a population that is friendly, culturally diverse and photogenic – to an excellent road and tourist infrastructure and oodles of elbow room. The ‘burning mountain’ or ‘Dâureb’ (in Damara-Nama) glows orange red in the late afternoon light as the sun catches its granite rock. The highest mountain in Namibia, with Königstein peaking at 2 573 metres, towers above the grassy plains. Formed 130 million years ago, the Brandberg consists predominantly of different types of granite. In the dry season hunter-gatherers assembled amongst the small waterholes and greenery, living on plant food and small game, and using rock overhangs as their canvases. Mixing earth pigment with egg white or animal blood, and painting with brushes made from animal hair, they portrayed people rather than animals on their rocky canvas. Much younger than the Twyfelfontein engravings, the White Lady rock painting, a highlight on a Brandberg excursion, is estimated to be approximately 2 000 years old, having survived rain, weathering and time. The White Lady, the name coined by Henri Breuil in 1955, is now understood to represent a healer or medicine man holding a bow and arrow in one hand and a cup or wand in the other. The Dâureb Mountain Guides accompany visitors to the two sites. Along the route they point out the flora and fauna in the area, including the endemic Brandberg acacia, Acacia montis-usti, that thrives in the mountain enclave. The dusty gravel road from Opuwo to Epupa Falls passes Himba dwellings and a gauntlet of baobab trees bedecked with birds’ nests before reaching the verdant makalani forest on the banks of the river. Here, the waters of the Kunene plunge into the rocky gorge in a scenic display of waterfalls, a fine mist rising into the air, reflecting a myriad rainbows. 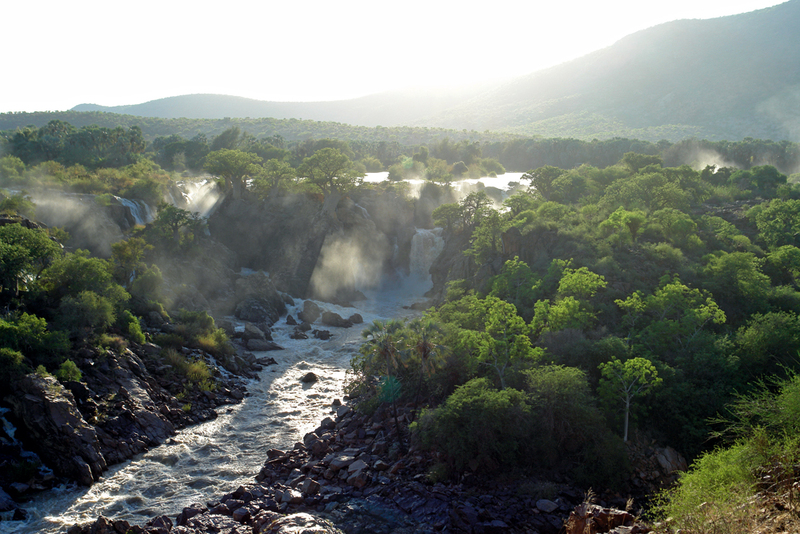 The Epupa Falls, embraced by lush vegetation and a few determined baobabs, has an inimitable African charm. The rocks along the riverbank provide good washing pools, multi-coloured strings of clothing hang between the palms, and a few bathers splash in the water. Listen for the rufus-tailed palm thrush that can be heard singing in the early mornings, and keep an eye open for the African fish eagles, bee-eaters, kingfishers, rosy-faced lovebirds and paradise flycatchers that can be seen in this riverine habitat. Abounding with character, Epupa Falls plays a continual melody of rushing water that is heard from the shade of the makalani palms. The simplicity of the site and the splendour of the falls resonate with magic. 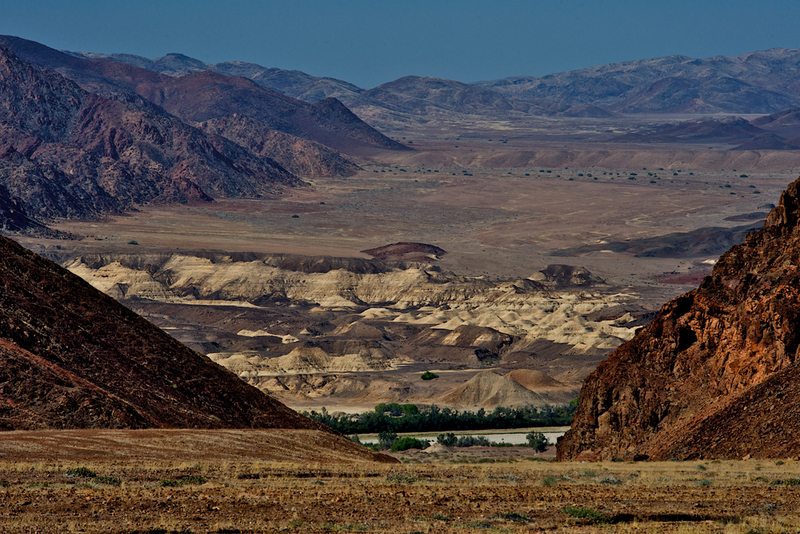 Travelling through the north-western corner of Namibia makes you tingle with excitement. The rocky roads, rugged terrain, inhospitable desert, dust and dryness may make some travellers query this sentiment, but look a little closer with different eyes. This is wild land where desert-adapted elephant and black rhino roam, ephemeral rivers surge down with the pent-up force of summer, ‘desert’ lion watch from river reeds; hunter-gatherers’ prayers are etched into cathedrals of rock; semi-nomadic Himba groups reside in mud-and-dung huts; enigmatic fairy circles dot the land, and long-leaved welwitschias battle with the elements. Here lies a deep beauty and raw energy that take the traveller from the world of mediocrity to one of value, from noise to quiet, from excess to essence. 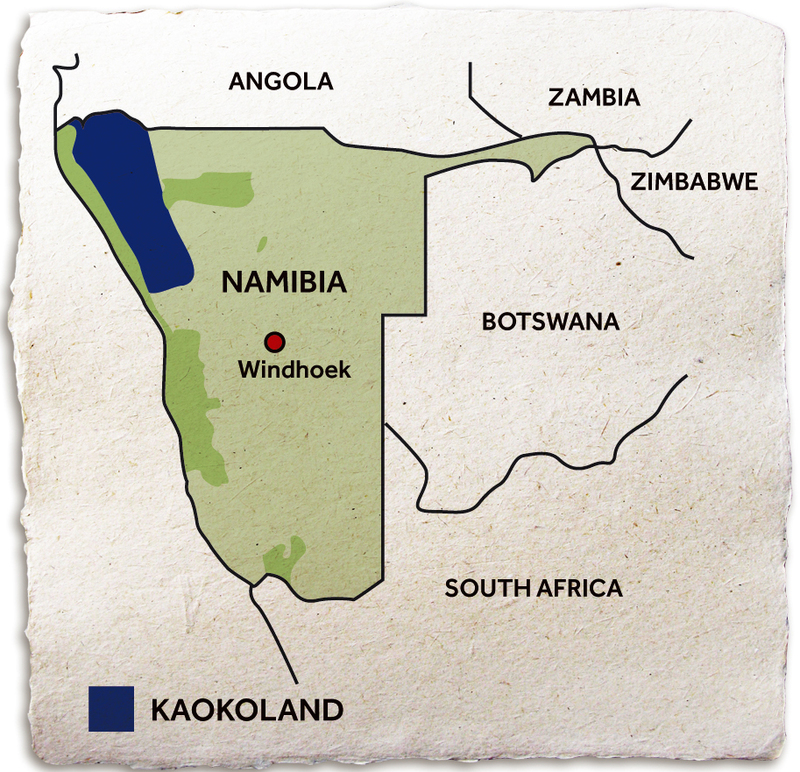 The land historically known as the Kaokoveld, encompassing Damaraland in the south and Kaokoland in the north, forms part of the Kunene Region, with a bit of the Erongo Region thrown in for good measure. It is a destination far away from the city lights, where stars replace television, and animal tracks fulfil the role of newspapers. This is a place where the Earth talks. 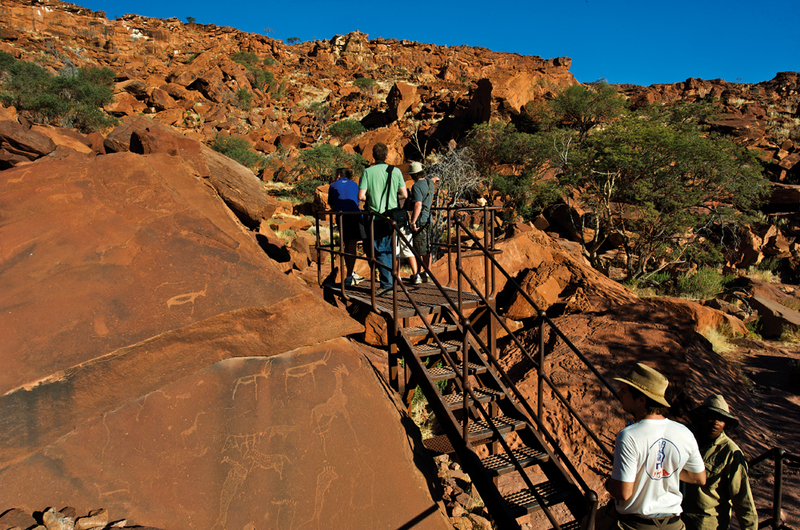 The intriguing rock art of Twyfelfontein and the Brandberg is accessible by well-travelled gravel roads. Further north, the more remote areas of Kaokoland require caution and care. Come prepared. Rod-like euphorbias, inselbergs, rocks and the red earth of Damaraland merge and mingle with mopane savannah, granite outcrops and mountains, transforming into spectacular desert and gravel plains, bisected by ephemeral rivers and reaching the crocodile-infested Kunene River bordering Angola in the north. Here, the waters of Epupa Falls tumble down a chasm guarded by tenacious baobab sentinels clinging precariously to the rocky slopes. Traveller’s etiquette is required of Kaokoveld travellers to respect the local inhabitants, and the land and her creatures. In turn, and in time, she will reveal all her wonders. 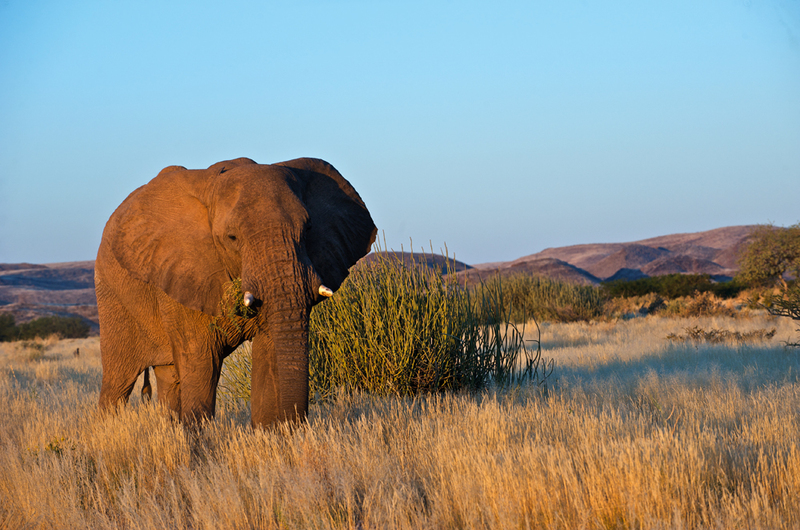 One of the wonders of the Kaokoveld is the free-roaming population of desert-adapted elephant. These hardy pachyderms follow the dry river courses from the Ugab River northwards, often moving off in the rainy season when there is water elsewhere. They feed on the riverine vegetation, drink from the springs and dig for underground water, stamping out holes in the sand, referred to as gorras. These desert kings travel great distances and forage more carefully than their brothers inhabiting more abundant regions. Once thought to be a subspecies of the African elephant, Loxodonta africana, they are simply a separate population. With less to eat than the Etosha elephants, they have less bulk, appearing taller than they really are. They also have larger feet, an adaptation to walking habitually on desert sand. Their survival, like that of many other game species in Namibia, is partly due to the success of the conservancy programme in Namibia, which enables rural communities to manage wildlife and tourism sustainably in their areas, often devising methods to live harmoniously with their animal neighbours. To come across these giants is a privilege. Reduce your speed, stay in your vehicle and keep your distance, allowing them to move off peacefully. We are visitors to their land. 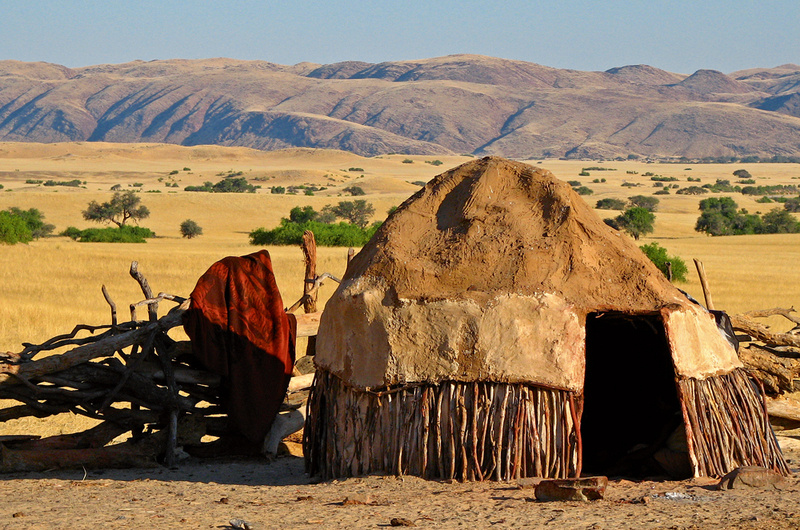 Remote Himba settlements are dotted throughout Kaokoland, and the striking Himba people add to the unusual beauty of this part of the country. 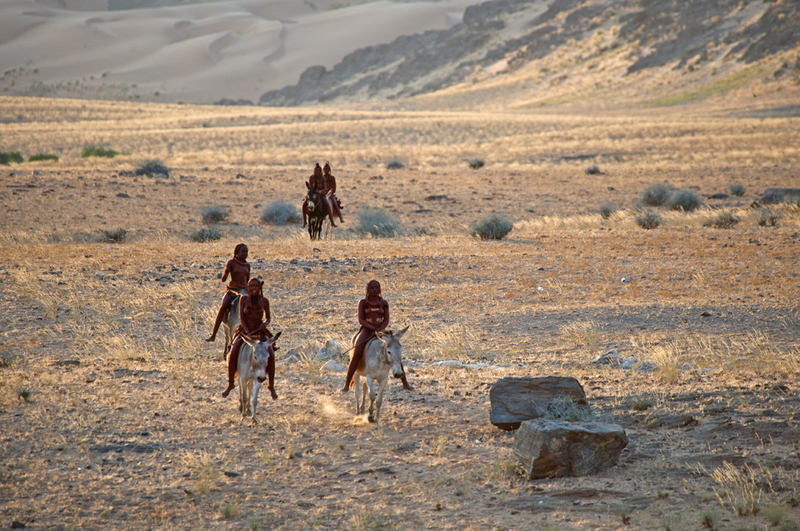 One of the last semi-nomadic desert-dwelling groups in Africa, they live in the arid regions of north-western Namibia and southern Angola, originating from Herero groups who migrated from East Africa in the 16th century. Homesteads comprise a few dome-like shelters positioned around a central animal enclosure and a sacred fire. Although some of the men have adopted a more western style of dress, the women retain their traditional appearance, their skins richly coloured with a combination of red ochre, fat and aromatic resin. Rarely coming in contact with water, the mixture serves not only as part of their beauty ritual, but as a cleanser and lotion to offer protection in the harsh desert environment. The IRDNC (Integrated Rural Development and Nature Conservation) initiated a project in the far northern reaches of Kaokoland whereby local people harvest the golden resin from the hardy Commiphora wildii tree, which has been used as a traditional Himba perfume for generations, providing a much-needed income in the driest time of the year. Most of the resin is sent to Europe for use as a secret African ingredient in French perfume. In remote north-western Namibia in the Kunene Region, the IRDNC (Integrated Rural Development and Nature Conservation) has initiated the Commiphora wildii project, whereby local people harvest the golden resin that falls to the ground from these small resilient trees, also referred to as kanniedood, an Afrikaans words meaning ‘cannot die’. 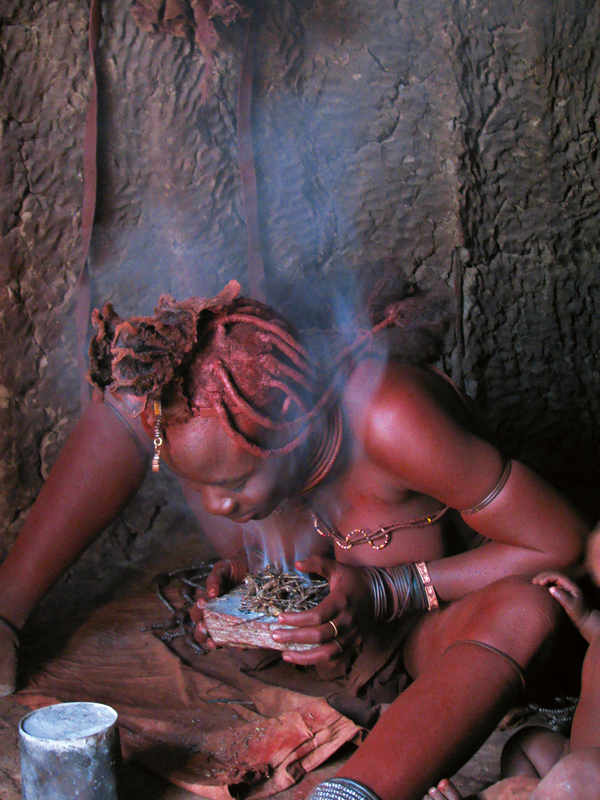 The resin has been used as a traditional Himba perfume for generations. The trees produce the resin in the dry season and the Himba harvest it from October until the onset of the main rains, usually in February. Collecting the gum from the ground around the trees involves local people from five conservancies in the region. Most of the resin is sent to Europe to be used as a secret ingredient in French perfume, with the balance going to Australia and South Africa. 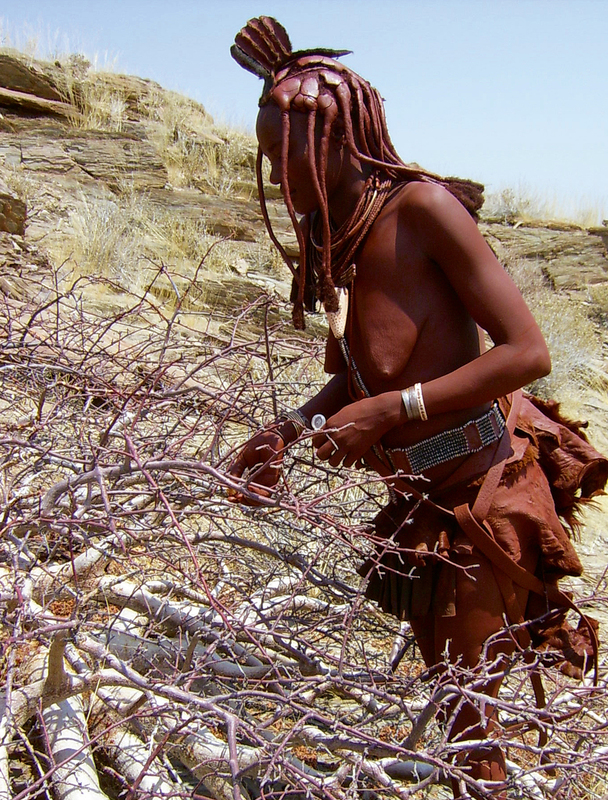 In November 2004, the IRDNC began investigating the commiphora perfume plants used by the Himba people in the region. This was followed with vegetation mapping, surveys and trial harvests, identifying the species Commiphora wildii, called omumbiri in the Himba language, as the most important resin-producing perfume plant used by Himba women. The objective was to ensure that the resin would be harvested sustainably; that only resin secreted naturally from the tree is collected; and that the trees are monitored after the harvest to check that they have not been damaged in the process. During the 2006/2007 harvest season, it was estimated that the approximate production of resin every year was 50 tons in the five conservancies (Puros, Orupembe, Marienfluss, Sanitatas and Okondjombo) involved in the project. The first commercial resin harvest was carried out in October 2007. Conservancy members were interviewed and met in subsequent months to address issues that required attention before the next harvest. Harvesting had to be stopped early in some of the conservancies during the second commercial harvest of omumbiri in 2008/2009 as a result of early rains. In some of the areas harvesters need to walk as far as 20 km from their villages to collect the resin. All harvesters are required to register, be conservancy members and abide by the harvesting rules. The harvesters averaged 250 members in the first two harvests. At US$10 per kilogram of resin, the money earned provides a much-needed income in these rural areas. With each of the female harvesters having several dependants, the benefits from the omumbiri harvesting are far-reaching. The resin is harvested during the driest months of the year when animals are thin and producing minimal milk, and when water sources are drying up. Most of the money earned is used immediately for food to tide the harvesters and their families over the dry, hot period until the summer rains. The golden globules of amber resin from these distinctive, diminutive trees are literally gold in this arid region of subsistence farming where the chances of earning additional income are minimal. Harvesting the aromatic Himba perfume essence, with no detrimental consequences to the environment, gives the conservancies in this remote north-western part of the country an unexpected and fruitful opportunity, casting some doubt on the veracity of the old truism that money doesn’t grow on trees. Community campsites serve as attractive base camps while travelling in the north-western part of the country. Very different to conventional campsites, they are often masterfully and creatively constructed, using local material, and incorporating enormous boulders into their design. Campsites in the rugged Kaokoland are not for those wanting electricity, crowds and stocked bars. The luxuries of camping, however, are provided – running water, hot showers, the water heated in efficient wood burners, and firewood. Mother Nature provides the rest: spectacular settings, the soft sound of birds and geckos, and a celestial show that screens every night,free of charge. 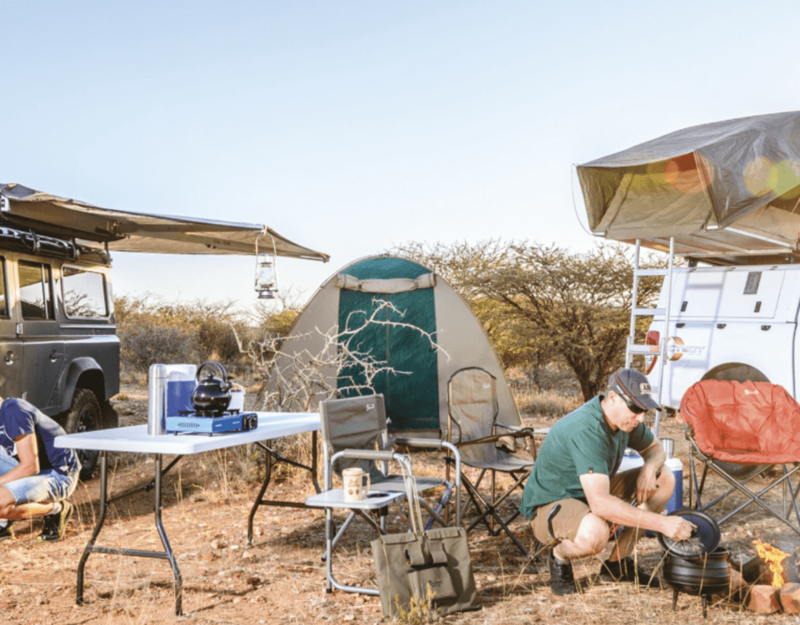 Don’t miss the small Granietkop Doro !Nawas Campsite along the D2612 to Twyfelfontein, with its three sites built in alcoves of granite rock; the Khowarib Campsite en route to Sesfontein, overlooking the Khowarib Schlucht; Hoada Campsite, the enchanting boulder retreat on the Grootberg Pass between Palmwag and Kamanjab; and if four-wheel-driving further north, the rustic Puros Campsite on the banks of the Hoarusib River frequented by desert-adapted elephant and the Okarohombo Campsite in the Marienfluss. These are places where you can savour the simple pleasures of life. In addition to the perennial Kunene and Orange rivers bordering the country in the north and south, and the rivers in the far north-eastern arm of the country, Namibia is bisected by an ephemeral river system. 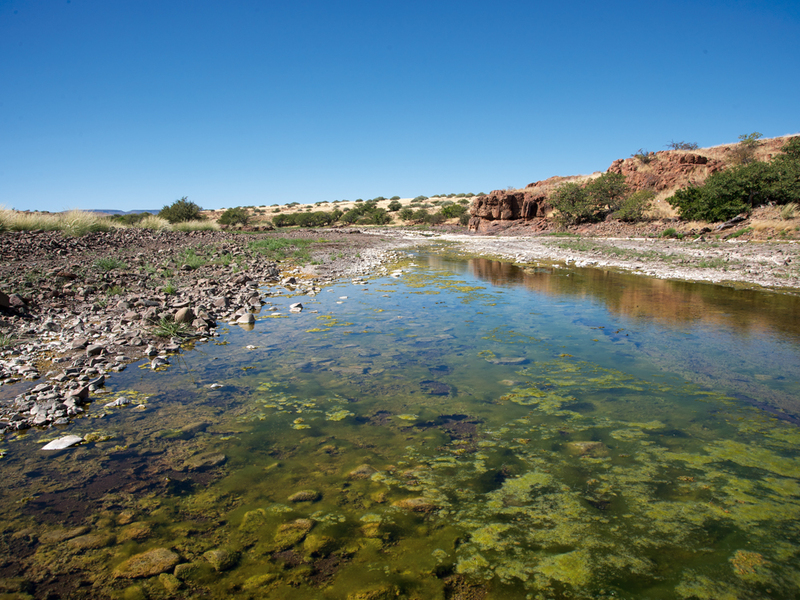 Winter visitors to Namibia will be surprised to find that these rivers are dry throughout most of the year. During the summer rainfall months, water collects in their catchment areas and surges down the watercourses in flash floods. These floods, although short-lived, bring essential nutrients to the soil and recharge the underground aquifers. In an arid country such as Namibia, underground water is essential for all inhabitants, human and animal. The dry river courses, fringed with riverine vegetation, act as corridors for well-publicised species such as desert-adapted elephants and black rhinos, and offer refuges for many other animals, including gemsbok, springbok, giraffe, ostrich, baboon and lion. In years of exceptional rainfall, several of the larger rivers such as the Ugab and Hoarusib reach the sea. The west-flowing ephemeral rivers are part of the character and ecology of Kaokoland, representing important arteries of life. Understanding the importance of precious drops of water in the desert provides a key to the land, her people and her wildlife, her marvels and her mysteries. Etched into Etjo sandstone and coated with desert varnish, the Twyfelfontein engravings, awarded World Heritage status in 2007, form an important link to our past. The predecessors of the present-day San/Bushmen sought refuge in the valley close to the trickling spring during the hot dry months of the year, an area now called Twyfelfontein, ‘Doubtful Spring’. The engravings, dating back 2 000 to 5 000 years, have spawned many theories regarding their purpose. Although some suggest they are maps of water sources, records of events or educational in nature, it is more plausible that the engravings, unlike the younger rock paintings, are ritualistic in origin. What appears to be an art gallery, displaying animal engravings, is rather thought to be the shaman or medicine man’s communication with the gods for food, rain, healing and luck for the hunt – crucial for the survival of hunter-gatherers in an arid land. The act of engraving could have enabled the shaman to focus his energy, while some locations may have acted as doorways to the spirit world or points of power. 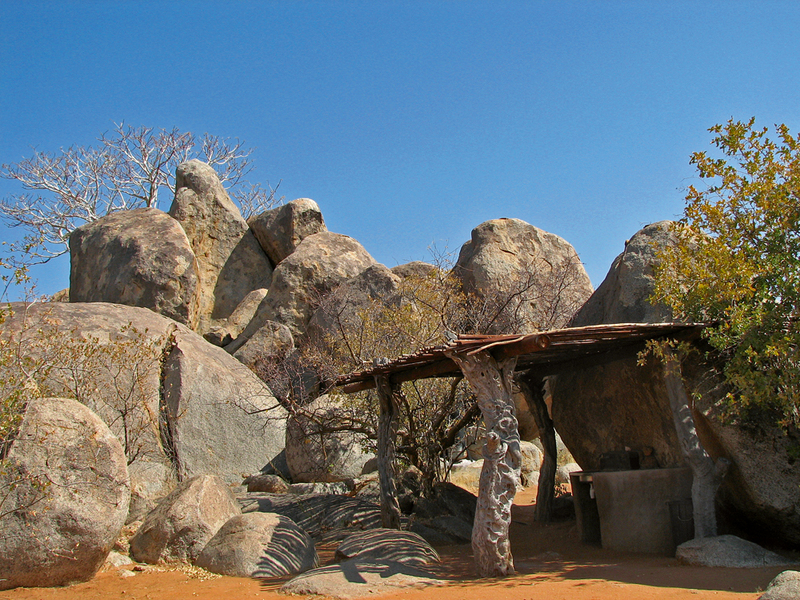 The dry Namibian climate acts as a guardian for the ‘prayers’ engraved in the porous rock, allowing us and future generations to behold the sacred treasure. This article was first published in the Travel News Namibia Autumn 2012 issue.